The Triumph 4315 Semi-Automatic Tabletop Cutter utilizes a spindle clamp system that evenly applies pressure along the entire cutting length, manually adjusted back gauge, and dual side guides. The Triumph 4315 has a cutting width of 16 7/8" and a cutting capacity of 1 1/2". In addition, the 4315 has 9" of table space in front of the blade and 17" of space behind the blade. The Triumph 4315 Tabletop Cutter has an external blade depth adjustment, two handed operation for safety, transparent safety guards on front and rear tables, automatic blade return, disc braking system and safety lock with key and main switch. Cutter arrived and was super simple to setup and use. Directions were straight forward and machine works wonderfully. 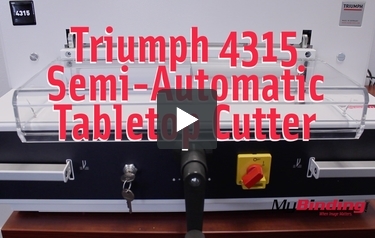 Transcript: This is the Triumph 4315 Semi-Automatic Tabletop Cutter! First of all, it has an electric measurement guide for the back stop for very precise cuts. You’ll see it goes all the way to about 17 inches—which you can also change to centimeters by sticking something like a paperclip into this little hole. Pulled out, the handle is loose to avoid any accidental adjustments. Push it in to rotate it and change the measurements. It also has a key locking system, so if you want to restrict access, and a lovely on and off switch. This is the Triumph 4315 Semi-Automatic Tabletop Cutter! In order to make a cut, it has a two hand operation as an extra safety feature. If you turn on the machine and it’s flash some unusual stuff, it just means that it doesn’t know where the back gauge is positioned. Reset it all the way forward, then you’re good to go. You’ll see the back gauge in action here. Compared to a ream of paper, it’s close, but not enough. It should do well to cut about 300 pages. A good guide to use is the paper knock-up block for a maximum stack size. There we go, not use the block to even your pages together. There is a laser light to show you exactly where your cut will happen. With my stack ready, I’m going to lower the safety shield, and and bring down the clamp. Give it a light tap to lock it in place. Now with both hands, hold the levers down until the cut is finished, then let go. Now I have a very cleanly cut stack of pages. For consistent cuts, there is a cutting mat should be changed from time to time, which can be rotated around for 4 clean positions, then flipped and rotated again for a total of 8 positions. It has a cutting width that is just below 17 inches. Provided accessories include, the knock-up block, a few tools, and a blade replacement holder. If you are getting an incomplete cut, adjust this knob to lower—or raise—the blade. 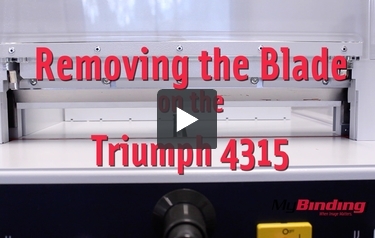 Transcript: This is how to Remove and Change the Blade on the Triumph 4315 Stack Cutter! You’ll have to find a local business to sharpen the blade for you, and it is a common practice to have a spare blade for when the other one is being sharpened. So, now I’ll show you how to remove the blade so it can be sharpened. All of the tool you see are provided with the cutter. We’re primarily going to use the hex-bolt tool and the blade holder. This is how to Remove and Change the Blade on the Triumph 4315 Stack Cutter! If you line up the blade holder, you’ll see the two handles line up with two screws that are holding the blade to the machine. We’ll start by unscrewing these two screws. Then fit the holder up against the blade, and twist the handles to latch the holder actually onto the blade. Now completely unscrew the other three bolts. With all the bolts off, the blade is freed from the machine, which we can safely remove from here. Using the provided tools and this process protects yourself from getting cut on the very sharp blade. At this point, putting on another blade should be pretty self explanatory, but there is a trick to lining up the blade for an even and complete cut. Do not tighten the bolts very tight to start. With the blade secured in place, but loose still, make a cut without any pages. This should push the blade into an parallel position with the cutting bar. Now tighten it and do a test with a single page along the entire length. If it works, then you’re done! If your blade is not aligned at that point, you’ll get an incomplete cut like this. If it still won’t cut the sheet, then make some micro adjustments on the right to lower the blade position a little more. The 4315 is a terrific machine to use if you want to be able to slice through a good amount of paper at once. When you use this device, you can cut up to 1.5" of paper per pass, so it won't take you very long to prepare your materials for special projects. This shredder is great for both small and large cutting jobs thanks to its cutting width of 16-7/8". The cutting length behind the blade is 17" and there's 9" of space in front of it, so you won't have any trouble working with paper of varying sizes. The 4315 is pretty safe to use because it has a Safety Cutting System. This system includes transparent safety guards at both the back and the front of the device. When you cut your materials, you need to use both hands to operate the machine so they won't be anywhere near the blade. Also, there is a lock and key feature so you will be able to prevent unauthorized use. While these safety features are helpful, you should still exercise caution when using this device. After all, it's better to be safe than sorry. Using this cutter is pretty easy once you get the hang of it. The device has an external blade depth adjustment feature as well as a back gauge that can be manually adjusted. There is even a an LED cutting line so you will be able to see exactly where your paper will be cut. Overall, the 4315 is very durable and it features a Solingen steel blade for your convenience. There are other metal parts so you will definitely be able to get a lot of use out of this device over the years. The 4315 is a heavy-duty machine, so it might not be the best choice if you just need a cutter for occasional use. Luckily, there are plenty of rotary trimmers and guillotine cutters available that are suitable for smaller jobs. This cutter is very large, so it's not recommended for small work areas. The machine's approximate dimensions are 35" (depth) x 25" (width) x 14" (height), so you should use it with a cabinet or stand to keep your work surfaces clear. Unfortunately, the stands and cabinets available for this device are sold separately, so you will need to put out extra money to get one. The MBM Triumph 4315 is a terrific paper cutter and it's a great choice if you need a device for heavy-duty use. This machine has an excellent cutting capacity, great safety features, and it's durable so you will be able to get a lot of use out of it. You just need to be aware that this device is large and that you should consider purchasing a stand or cabinet for it. If the 4315 sounds like the right cutter for your workplace, take a look at it today. Swing and bump the lever on the fastaction clamp to tighten, then cut.